REDUCED! 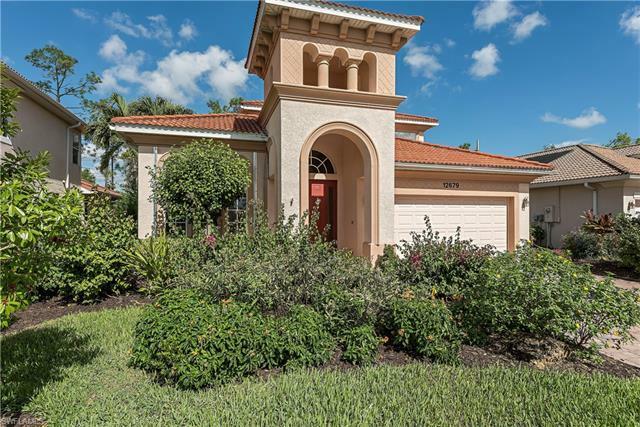 Fabulous custom two story home featuring the desirable Tiena floor plan with four bedrooms, three full baths on a private secluded lot in the heart of Naples. Welcoming entry, atrium courtyard, volume ceilings, crown molding, water purification system, and 2 new A/C units are just a few of the details of this home. First floor with two family rooms, fabulous kitchen with granite countertops, pantry, gas stove, and breakfast nook as well as formal dining, a bedroom and bathroom. Making your way to the second floor you will find two additional bedrooms with adjoining bathroom, loft, Spacious master suite. Heated salt-water pool and spa nestled in the screened lanai and surrounded by lush preserve and tropical landscape, perfect to relax and entertain. Aviano offers a relaxed lifestyle and amenities including: clubhouse, swimming pool, hot tub, and fitness center. Centrally located in the heart of Naples Naples, just minutes away from shopping, dining, I-75, schools, downtown Naples, and the pristine sandy white beaches.